If you are looking to add a cool tone to your home or commercial business, you may want to consider using blue glass blocks from Quality Glass Block's color glass block line. 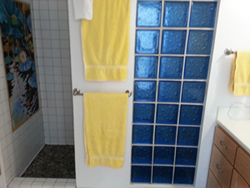 Our blue glass block can be used in many projects including custom shower enclosures, windows, walls, and many other unique applications. The semi transparency of projects constructed with our blue glass block allow for both light transmission and privacy at the same time. When you choose to use blue glass blocks, the light that is transmitted will be of a cool blue tone that will give your interiors a unique look and feel. For those looking for the highest quality colored glass blocks and superior customer service, look no further than Quality Glass Block. Our blue glass blocks are backed by a full warranty, and your satisfaction is of the utmost importance. Whether your blue glass block order is large, or you only require a few blocks, your color blue glass blocks are made to order. Architects, contractors, interior designers, and homeowners choose Quality Glass Block's Color Glass Block Line to provide the highest quality glass blocks, in the widest selection of colors, at the most affordable prices. Contact us today!